She married the Furst of Hohanzollern-Sigmaringen, after his first wife Maria Theresa of Naples (daughter of Countess Mathilde Trani, so niece of Empress Sisi) died. From reports, she was a good stepmother to the three motherless children ( a pair of twins and a daughter Augusta Victoria, later married King Manuel of Portugal). In most of her pictures and photos she looks quite sad and as if she had a bad-health. I´ve seen just a few pictures, Sveta, but, yes, she looks very sad, never a smile in her lips...But she seems a nice woman, also. 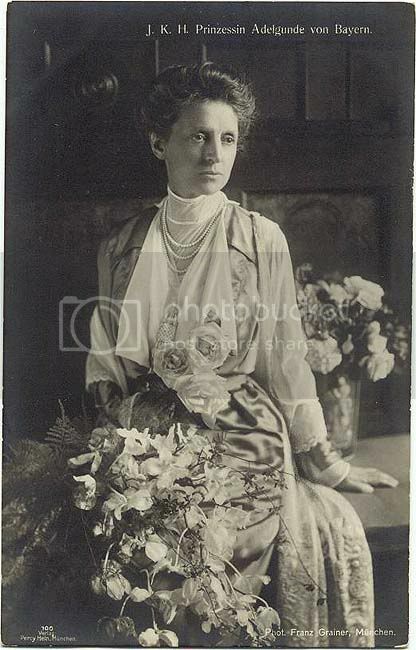 I´m glad to know she was a good stepmother to the children borne by Mädi to Fürst Wilhelm Hohenzollern-Sigmarigen. A question...the second marriage of Wilhelm with Adelgunde was a love match or an arranged one to provide the widow a stepmother for the children? Adelgunde actually looked very much like Queen Therese of Bavaria, her mother. Was she 45 years old when she married?? I suppose she had not a better chance to marry before Fürst Hohenzollern-Sigmarigen...true? she did look a bit delicate...maybe sickly like Madi ? She had too much sisters, I´m affraid. Adelgunde was oldest from seven girls. Two of them were never married (Hildegarde and Helmtrud), three of them married young (Marie to Prince of Bourbon-Two Sicilies, Mathilde to Prince of Saxe-Coburg-Gotha and youngest Gundelinde to Graf Preysing-Lichtenegg-Moos). Same destiny as Adelgunde had her sister Wiltrud, who married (when she was 40 years old) widowed Duke Wilhelm of Urrach, who had nine children from his first marriage with Duchess Amelie in Bavaria. I understand, beladona...Ludwig and Maria Theresa had too much daughters to marry all them in a "convenable" way! 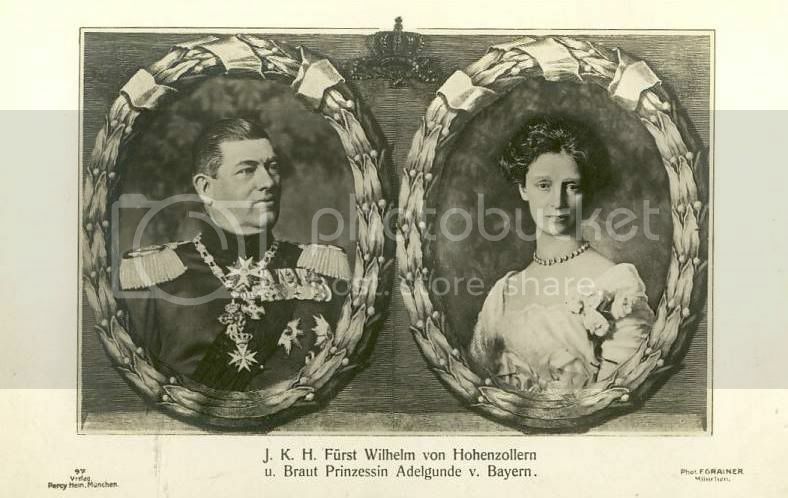 On her Wedding Photos, Adelgund looks not very happy, but her husband Wilhelm von Hohenzollern seams to be glad! I didn't know that lady, her biography sounds interesting. Can you post a summary of her biography? Did she had a sad or hard life? She was six years younger than her husband, but they looks there like mother and son!